By targost in Featured on June 8, 2017 . The Kenosha Community Foundation awarded grants totaling $56,000 to 14 Kenosha County not-for-profit organizations and projects. According to Executive Director Robert Schneider, these grants are derived from the income earned by the Foundation’s Unrestricted endowment funds. With these grant awards, the Foundation completes the its competitive grant making for 2017. This year, the Foundation awarded competitive grants to not-for-profit organizations totaling $107,000 – a 19 percent increase from 2016. Earlier in January, the Foundation awarded $51,000 in grants from its Field of Interest funds. 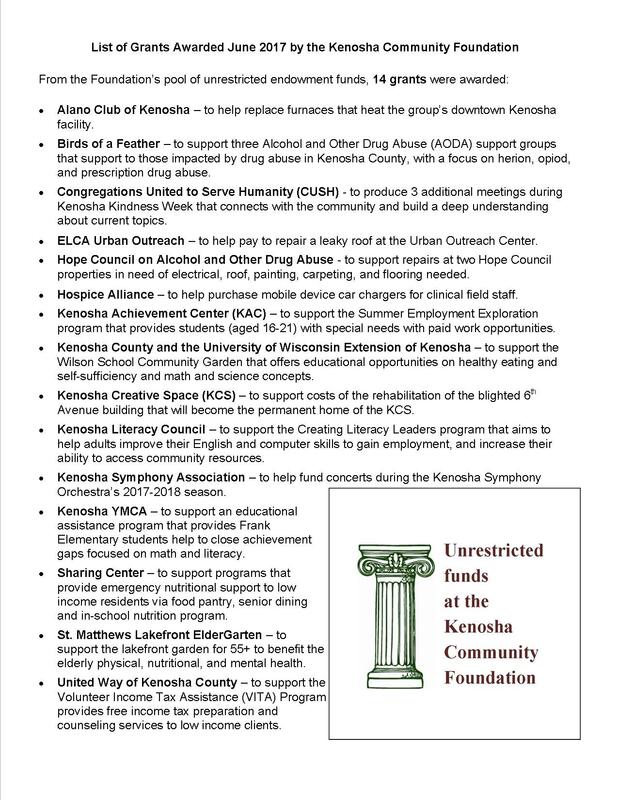 Details on the Foundation’s grants making is posted online on its website (kenoshafoundation.org) and on the Kenosha Community Foundation Facebook page. A full list of 2017 Unrestricted Funds grants awarded by the Community Foundation follows.